No offence…I know we all are particular in keeping our house clean. But then how many times it has happened that one member falls sick and remaining all family members follow the suit or after being down with illness your child fall sick again immediately…. It happens right. The truth is, though these germs are too small, they are contagious, can spread fast and can stay alive for quite some time…waiting to pounce on next victim. 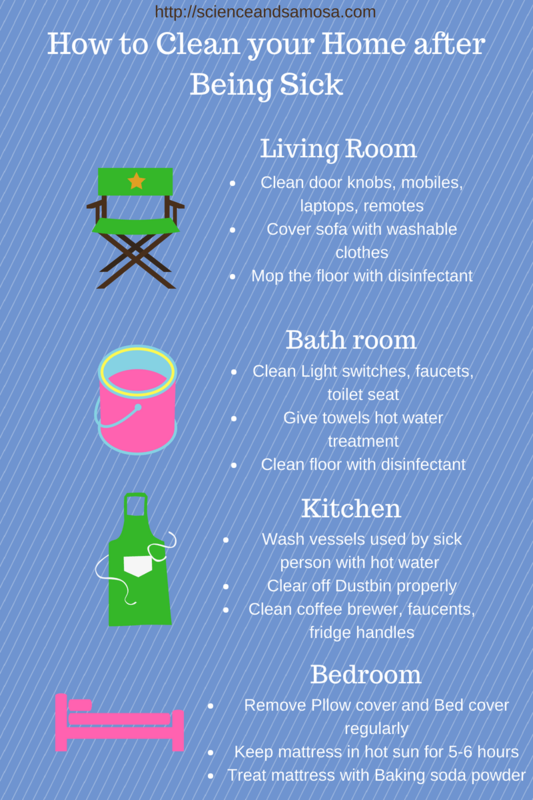 You need to follow strict cleaning practice, especially when a family member falls sick. You have to continue this practice for few more days even after the person recovers from illness. This is to wipe out all germs from your house completely. 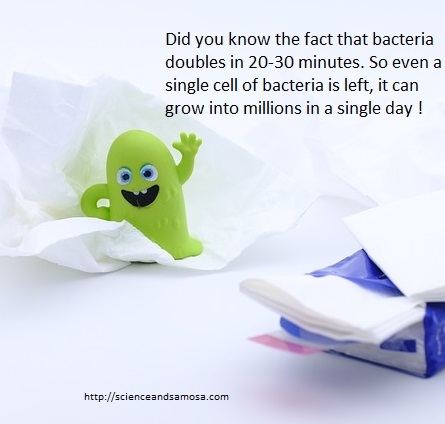 Did you know the fact that bacteria doubles in 20-30 minutes. So even a single cell of bacteria is left, it can grow into millions in a single day ! Now no one can confine a sick person to bedroom alone. They would be using mobiles, watching television and using living room furniture and facilities. The moment a person falls sick it’s better to cover sofa and upholstery with washable sheets and blankets. In that way, the furniture will remain germ free. It’s advisable to remove decorative pillows and show pieces from living area. It is advisable to clean every day door knobs, light switches, cell phone, remote control, laptops, toys etc with good quality disinfectant. It’s your mattress that’s going to get the maximum load of germs. So to prevent your mattress from becoming a hiding place for germs, it’s better to give the mattress an extra layer of covering. Also when a person is sick they will sweat a lot. This sweat will seep into mattress and pillows, and can cause stains and smells. The extra protection layer given by you will help to absorb any excess sweat and keep pillows and mattress clean. If the disease lasts for a long period it would be good to expose mattress to day-light for 5-6 hours. To make the mattress perfect one can sprinkle a combination of baking soda and essential oil over it and later remove it with the help of a vacuum cleaner. The warm, steamy environment makes it perfect for germs to grow. Especially if illness involved diarrhea, vomiting you must double up your sanitization plan. In addition to cleaning up toilet floor, flush, taps and basin you must also give towels a hot water wash. It’s good to allocate a separate towel for the sick or even encouraging them to use paper tissues on days of infection. Empty out dustbin with body secretion appropriately and give it as well a thorough wash.
Clean with disinfectant fridge handle, the faucet, cupboard and drawer handles. Also wash vessels used by sick person with hot water wash after each use. It’s advisable to give kitchen table and table top a good wipe with disinfectant. Use good quality disinfectant. One can even use bleach. Check whether it would be effective against bacteria and viruses. It is also advisable to wipe with paper towels as sponge wipes might pick up germs while in use. Also the one who does this cleaning must either use sterilized gloves or must wash their hands thoroughly after doing this task.